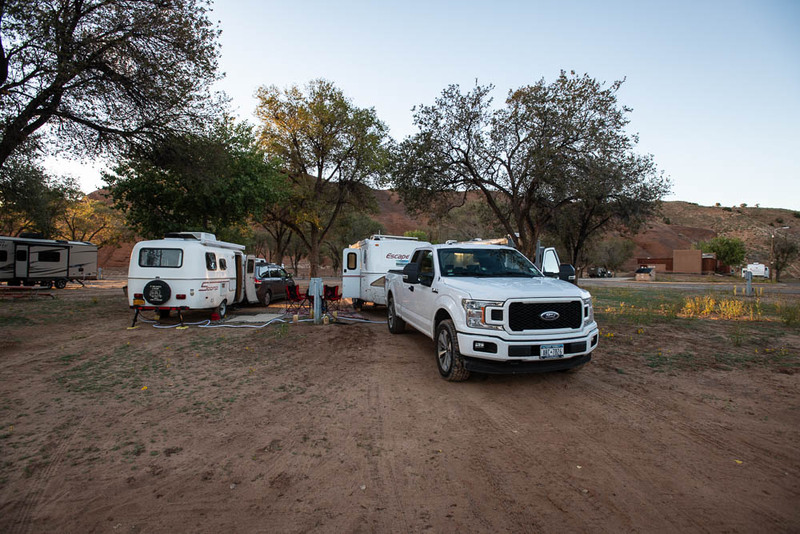 We left Fool Hollow under light rain, and, looking for some red cliffs along the route, followed the suggestions of one of the Toyota drivers that brought Don & Anne back to the campground. I don't know if we went wrong, or his idea of red cliffs was very different from ours, but we never saw them. It did add 30 miles to the trip. In any case, we arrived at Red Pock Campground around 4:40, having lost an hour leaving Arizona. Red Rock is a sprawling campground, mostly on soft sand (that tracks into everything). 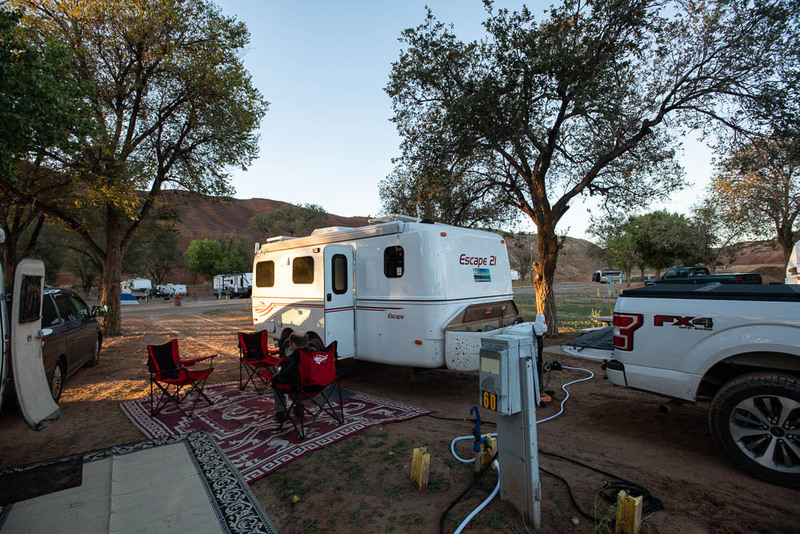 Sites have electric & water for $22.00 per night. The bathrooms are locked, but a key arrives with the guy collecting money. We cruised around looking for sites that had shade & would let us park close together, and settled on 59 & 60. The 30 amp receptacle on Don & Anne's site was dead, so we are both plugged into my pedestal, Don & Anne in the 50 amp receptacle with an adapter. Only one water faucet for both sites, but I have a splitter, so it worked out fine. We continued to look for sites for the next couple of days, concerned with finding anything because of the balloon festival. We have sites in Santa Fe for Friday & Saturday, but it is a long way to go. There is a Casino about 45 miles west of Albuquerque that has first come sites & they said they have only been half filled, so we will use them for Sunday, and maybe even for Friday & Saturday. Quite a bit cheaper & closer than Santa Fe. In any case, we have reservations during the week at the festival, so we think we are set for the near future. After that, Don & Anne will be heading back to NY, while I hang around NM, eventually heading to Texas, then Arizona. It was well past dinner time after we finalized our schedule, so we just nuked some chicken patties & pickled beets for dinner.